Epson InkJet Printers - PowerRIP 2000 for Epson Stylus Color Pro and Photo Printers - iProof Systems Inc.
Why make a color proof if the color is not accurate? With PowerRIP 2000 you can get the most accurate proofs available on your Epson Ink Jet printer. PowerRIP 2000 assures that the colors you see on your monitor or analog proof are the accurate colors that you expect. PowerRIP 2000 for Epson printers is $399 for the full desktop package and $999 for Large Format printers. See the order page for additional pricing and ordering options. The drivers that come with your printers distort the colors to make the prints look pretty for the novice user but are not usable in the professional market. This makes PowerRIP 2000 the choice among professional Graphic Artists, Designers, Printers and Lithographers who know the importance of accurate color proofs. With today's Mac's, PC's and digital presses, old analog film proofing systems can no longer do the job. PowerRIP 2000 proofing system provides an accurate color contract proof that emulates the printing press. With a combination of PowerRIP 2000, iProof's PressProof papers or the printer manufacturer's papers, you can select from several world standards including SWOP (the U.S. standard). PowerRIP 2000 is user friendly and designed to accommodate the single user or the entire office workgroup. PowerRIP 2000 includes a built-in print server that allows you to share your printer over the network. PowerRIP 2000 can publish up to 50 print queues across the network. Queues can be published as hot folders, to drag-and-drop PostScript, EPS, or PDF files for printing. Everyone on your network can print to your printer and PDF generator. 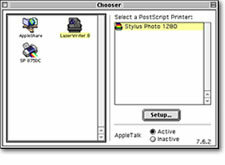 All PowerRIP 2000 active print queues appear as a Chooser level printer selection on the Macintosh network. Share your printer with as many users at no additional charge. There is also no need to purchase additional hardware to share your printer, PowerRIP 2000 Professional does it all. Print queue management allows you to reprint jobs directly from PowerRIP 2000, eliminating the need to return to your application to reprint a file. Change priorities, move the print jobs up or down in the queue, pause or cancel. Hold jobs in the queue for minutes, hours, or weeks, even pause jobs in the queue to print later. 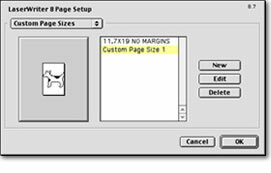 Create queues for specific paper, resolution, profile, combinations or create queues to generate PDFs for the web or remote print purposes. Most RIPs used as a proofing device will create incorrect results when trapping, overprinting and transparency features are used. The following sample shows trapping, overprinting and transparency features. These same features are used to show the trapping of colors and the drawing of outlines. Making a recomposite is the only true way of accurately making a color proof. This feature works great with all popular applications including Quark and PageMaker. PowerRIP 2000 comes pre-profiled to drive your Epson Ink Jet printer. Additional complicated color calibration is not required. Simply select the resolution and paper type and PowerRIP 2000 will automatically use appropriate color settings for accurate color reproduction on the selected media/printer combination. You may also use the included dot gain and calibration controls feature. Allows you to adjust each CMYK channel independently. Apply custom calibration to a specific print queue, so all jobs printed to that queue receive the same calibration. This provides fine tuning controls for accurate color reproduction. 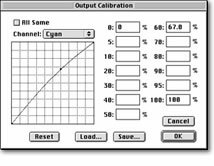 User defined calibration curves can be saved and later reloaded for jobs with similar characteristics. PowerRIP 2000 incorporates standards developed by the International Color Consortium (ICC) to produce color accurate proofs on your Epson Ink Jet printer. A wide range of paper profiles are supplied for your Epson printer. You may also add custom ICC profiles for your printing press, scanner, monitor or digital camera created with third party ICC complaint color profiling software. 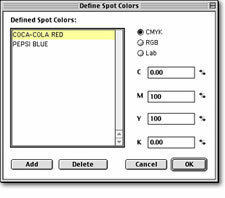 To ensure accurate spot color reproduction you can activate PowerRIP 2000's "TrueSpot™" you use special logo colors or product colors then you can easily add them to PowerRIP 2000 Professional with the Spot Color function. Just click on Add and type in your special color. PowerRIP 2000 Professional will remember your color and use it each time it is requested within your application. Unlike some applications that limit your designing abilities to set paper sizes, PowerRIP 2000 will let you design your own paper size and keep this size in memory for future use. Sometimes when the need arises you may want to process to disk before printing. This feature is useful for complex jobs where you do not want the printer to stop while printing. Allows PowerRIP 2000 to output a TIFF file instead of sending the page to the printer. This easy to use feature creates one TIFF file per page. Supports LZW compression, various resolutions from 72 dpi to 600 dpi. This feature allows you to print multiple pages on one sheet size. *Currently available on the Professional and LF Professional Windows version only. This feature allows you to print multiple pages on one sheet size. Example: you have a file that consists of multiple 8.5 x 11 sheets. Turn the Nesting feature on and it will print the pages 2-up on one 11 x 17 sheet. You may also output the pages reduced to get more pages per sheet. The Nesting function has two parameters, output size (at what percentage to render the individual pages) and destination sheet size (the size of the actual media we'll be printing on). Generate PDFs for the web or remote print purposes with PowerRIP 2000. Supports printing of Portable Document Format (PDF) formatted data up to and including v 1.3. PowerRIP 2000 allows documents formatted in PDF to be placed directly into the PowerRIP 2000 print queue without the need to go through the Acrobat print driver thus saving time. With its PostScript 3 RIP Interpreter built in, it will accept and process these files without the need to first "distill" or convert them. PowerRIP 2000 allows you to select the paper, resolution and color settings at the queue eliminating the need to select these settings for every job. Print borderless like a printing press. You create the bleed and we print on the proper sheet size. The bleed is overprint so you get exact sizing. The Borderless solution from the native printer driver will enlarge your image. This is not what we do; PowerRIP 2000 matches the printing press. Borderless printing available for the Epson Photo 2200, Photo 2100, Photo 960, Photo 950, Photo 925, Photo 915, Photo 830, Photo 825, Photo 820 and Photo 810 and the Epson Stylus PRO 4000, 7600, 9600.